Why we need to trim the nails for our pets ? - If the nails are too long,pets will slip and infected with germs. Long nails are dangerous. If let grow too long they can puncture their pads,become inflamed and fractured,making our pets painful,especially for those who stay at home for a long time. - One of the key ways to maintain your dog's general health is to cut the nails regularly. Having long nails makes the pet slip easily and breed bacteria. The long nails that grow into his paws will cause inflammation,changes the way a dog carries himself. To ensure the health of your dog, the first thing to do is clean your pet nails. #1 - Open the hemostatic powder in reserve. Lie flat on his back (large dogs can stand). #2 - Take your dog's paw and pull forward,pinch the nail you want to cut with your thumb and forefinger. Forefinger backwards with strength while thumb squeeze forward gently to expose the nails. #3 - Pay attention to your dog's bloodline,use the clipper downward sloping to cut the extra nails. #4 - If your dog's nails splinter when you trim them,or if they have sharp points leftover you may want to file them slightly. Use a large manicure file and run it across the bottom and side of the nail to reduce the sharp edges. (Ps:you should file very softly). #5 - QUALITY - The Clippers are produced to the quality standards demanded by professional dog groomers. #6 - FREE NAIL FILE - A free nail file is included along the handle of the clipper,for you to file your pet's nails,just pull it out whenever you need to use it! ★ ' Add to cart ', and quickly together to care for your dog ! 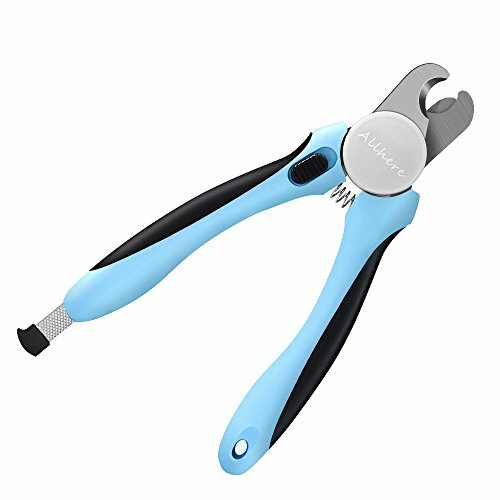 > PROFESSIONAL DOG NAIL CLIPPERS:The sharp cutting edge,made by high quality alloy material, looks glossy, ensure the product durable in use, do not worry about hurting your dog. > SAFETY STOP:The nail will be totally controlled in a safe range by a movable safety blade. > ERGONOMIC HANDLE:Design of a spring device near the shaft makes the product ease of use. hand-push switch makes it easy to open the clippers. > FREE Nail File:Plug-in file has a good effect on polishing, and can be storage easily after using. > PROFESSIONALS:The Livehomes pet nail clipper is an ergonomically designed Powerful and easy-to-use pet grooming tool to use for medium and large dogs and cats.